When the modern violin was first constructed hundreds of years ago there was only one type of string used. Although other materials were sometimes experimented with such as animal muscles, or connective tissue, sheep/lamb gut was preferred. The term “catgut” is used to describe these strings, but it does not by anyway mean that they were made from a type of feline. The first major advancement in string technology was the combination of gut, and metal. 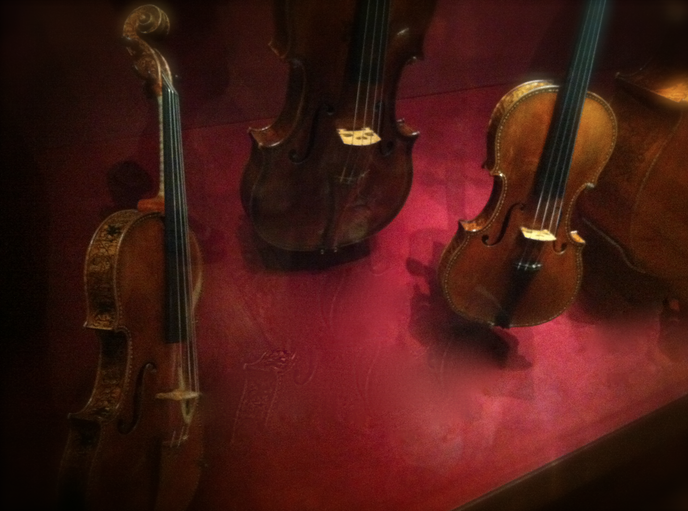 The violin G-string was often wound with silver while the other strings were just plain gut. This would raise the density of the G-string allowing it to be smaller in diameter, and create a more projection. Following wound G-strings the creation of the steel E-string grew in popularity in the late 19th century. Because gut E-strings had to be extremely thin to produce the desired pitch they were very prone to breaking. Some violinists made the transition to an all metal E-string voluntarily, while many were forced to because of the difficulty in animal trade during war times, plus the high production of steel made the material easily accessible. Full sets of metal core strings soon followed in the early 20th century. The cores were first made of solid strands of metal (usually steel), and later technology allowed for woven/roped metal core strings. strings with a rope cores are more flexible than solid metal core strings. One can imagine a suspension bridge having woven/roped metal strands for cables to help withstand the weight of the bridge, while allowing some movement. The largest criticism with metal strings is that they lack the richness of gut. Rope core metal strings helped to add more color to the sound produced compared to a solid metal core strings, but still could not achieve quite the same tonal quality at gut. Synthetic core strings were introduced in the mid-1900s and have bridged the gap between gut, and metal. They are not greatly effected by weather changes, are responsive, easily accessible, and can come much closer to the richness of gut strings than metal can. Dominant strings by Thomastik-Infeld was the first major synthetic string on the market, and are still a large part in the string world today. Most synthetic strings are created from a type of nylon (perlon). Other synthetic materials besides perlon are used as in Zyex strings from D’Addario which use a core made form the material zyex which is often made to string tennis rackets with. String companies are constantly experimenting with new materials to find that next big breakthrough in string technology. The sound that string players prefer tends to go in trends. Recently many violinists have adapted a more “soloistic” quality using brighter synthetic strings like Visions, or PI (Peter Infeld). There is only guessing where the string world will be going next.